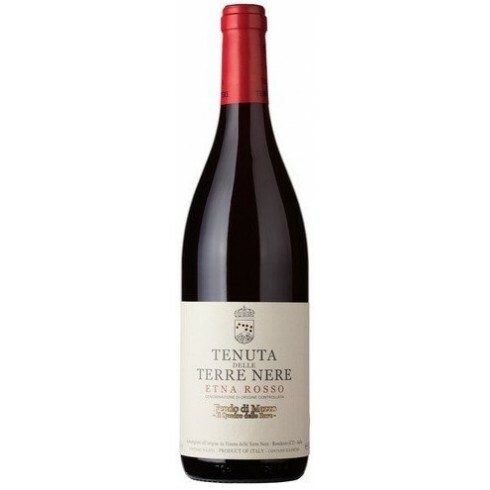 Tenuta Terre Nere - Feudo di Mezzo Etna Rosso On offer | Saporidoc UK. 2013 Feudo di Mezzo Etna Rosso from top producer Tenuta Terre Nere is an organic single vineyard wine. It is a supremely silky and complex red wine, its tannins suave and it has a charming fruity bouquet. Pairs with Meat and matured cheeses. Serve at 18-20 C.
The Feudo di Mezzo vineyard is located on the northern slopes of Mount Etna. The vines are 50-80 years old and produce very concentrated wines. The Nerello Mascalese grapes for the Feudo di Mezzo Etna Rosso were hand picket and fermented under controlled temperature. Spontaneous malolactic fermentation and ageing took place in French oak barriques and tonneaux. After 16-18 months of wood ageing and 1 month in steeltanks the wine was bottled.